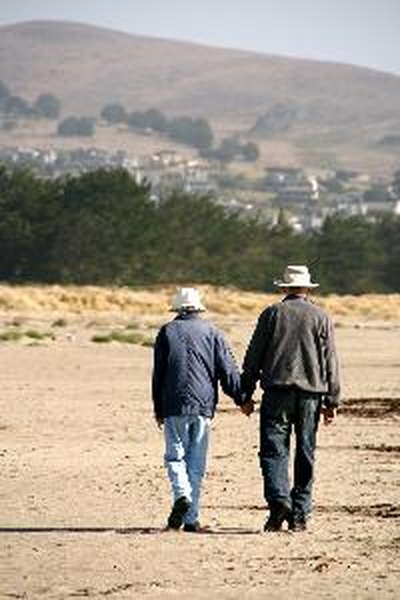 Bond funds can provide income to retirees. A 50-year-old investor should hold some bond funds in a portfolio. An individual at this age could traditionally retire in another 10 to 15 years. Too much exposure to equities, or stocks, at this age could result in declines in an investment portfolio that might not be regained in time for retirement. The closer that this investor gets to retirement, the more he should focus on protecting his assets, which is something that exposure to bond funds can produce. While there is no one strategy to follow for aging investors, some techniques might make it easier. A traditional investment portfolio holds both stock and bond funds. To determine the percentage of capital that should be exposed to bond funds, an investor could begin by subtracting his age from 100, according to Bankrate, which in this case would be 50. The result, which is 50, is the percentage that should be invested in stocks. In a traditional portfolio composed of stocks and bonds, the remaining percentage should be invested in bonds. When selecting bond funds, a 50-year-old investor should decide how much risk she can take. Risk tolerance can be characterized as the level of risk an investor is willing to absorb to earn the types of returns she is seeking. An aggressive investor would not need as much exposure to bond funds as an investor with more moderate return expectations. Someone who is more interested in protecting her money than increasing returns should be more heavily weighted in bond funds. Some bond funds expose investors to more risk than others. The most conservative bond funds buy fixed-income securities issued by the federal government. Bonds issued by municipalities, including cities and states, can be risky depending on the fiscal state of the issuers. Conservative bond funds invest only in the highest-rated municipal bonds. Corporate bonds, like municipal bonds, are often rated based on risk. The safest corporate bond funds invest in investment-grade securities while riskier bond funds, which have the potential to pay higher returns, invest in bonds that are rated below investment grade. One way for a 50-year-old investor to achieve an appropriate exposure to bond funds is by investing in target-date funds. These are investment portfolios labeled by an investor's anticipated retirement age, and they take the guesswork out of investing for individuals. They are designed by investment professionals, and the composition of the fund changes the closer the investors get to retirement age. By nature, these funds increase their exposure to bond securities as investors get older, according to a 2012 article on the CNN Money website. CNN Money: Is Investing in Two Target Date Funds Smart?